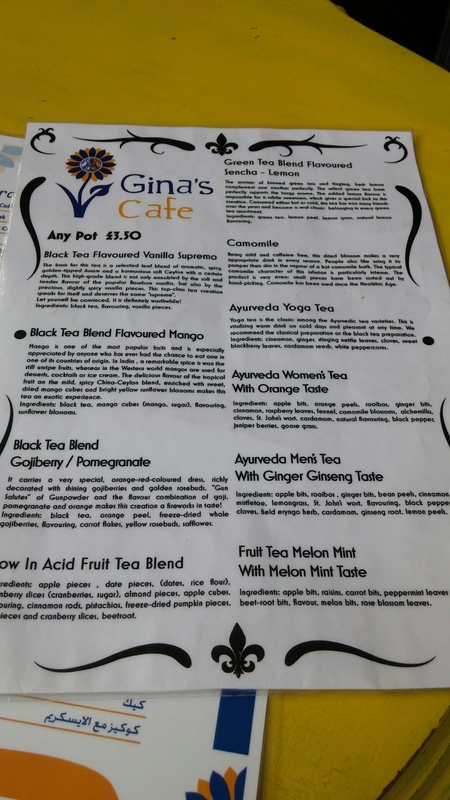 Made me a very happy chappati – Gina’s cafe (closed January 2018). Having been blown out for lunch by J (she said she emailed me, I said I didn’t see it so was left waiting for her before messaging her to ask where she was and being told “read your emails, idiot”), I was left in a bit of a quandry as to what to do for lunch (not having brought any in from home). 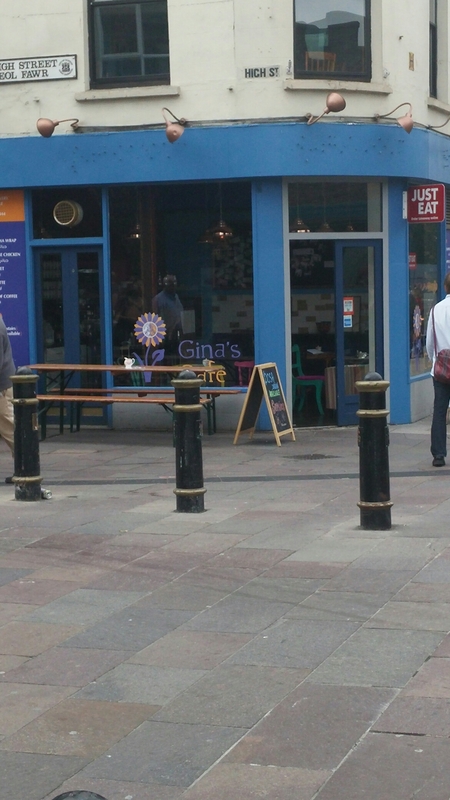 As luck would have it, I had had a conversation on twitter the night before about a joint at the top of the High Street (opposite the Castle) in Cardiff called Gina’s cafe. The consensus of opinion (from people whose opinions I trust – in the form of Cardiff in a tea cup and @callycupcake10) was it is a cracking place and well worth a visit. So off I trundled, solo, to give it a go. The place’s name gives no indication of the focus food wise. 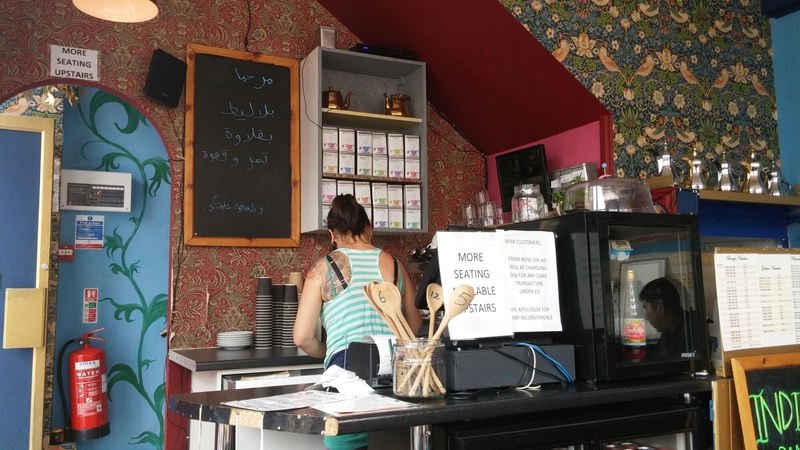 With a name like “Gina’s cafe” you expect your standard British “greasy spoon” cafe or possibly an Italian one ( or with their interesting, phonetically, twitter handle @vginascafe even a Brazilian ☺). 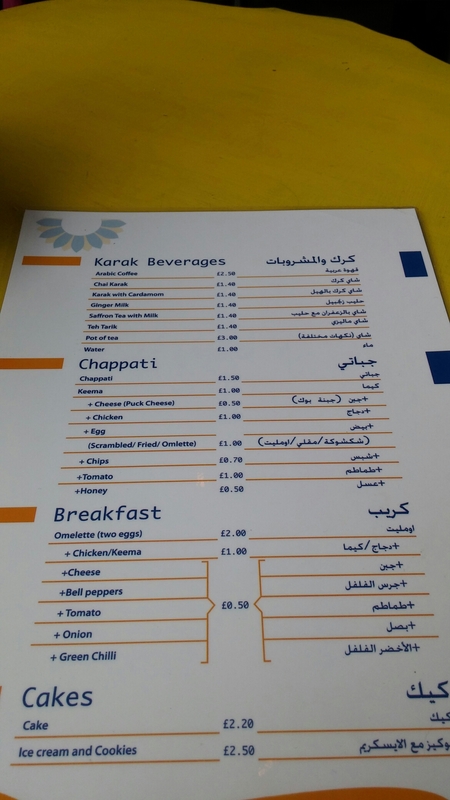 What you certainly don’t expect from that name is food and drink from the Arabian peninsula and the Indian subcontinent, but that is what you get in this place. It is a hole in the wall joint which at first sight looks tiny with only a few inside tables on the ground floor, but it has seating outside and also upstairs so don’t be put off if the tables by the counter are full. First impressions from the outside is it looks a touch shabby with limited signage. Needs a big Gina’s Cafe sign on the bare blue border about the door and a bit of tarting up on the outside.. It is, however, comfortable enough inside if a bit spartan (the upstairs area is a bit funkier, I believe, than the downstairs area). 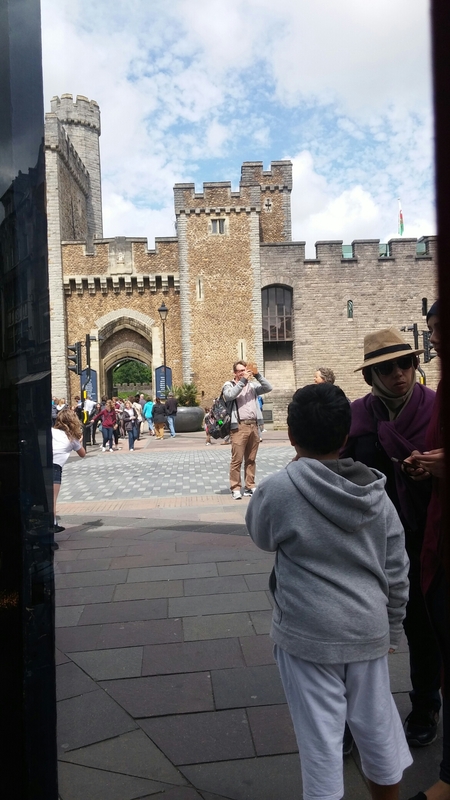 It is in a lovely position, having views across to Cardiff castle. and is a nice spot for just a coffee or lunch. For solo diners, like me, they have free wifi (you need to ask for the code) which is a nice bonus. as well as dosas (Indian pancakes). 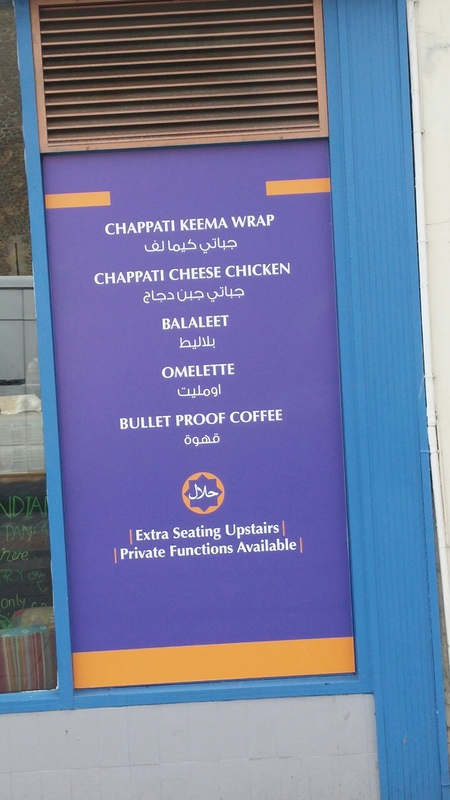 They also do a range of omelettes. 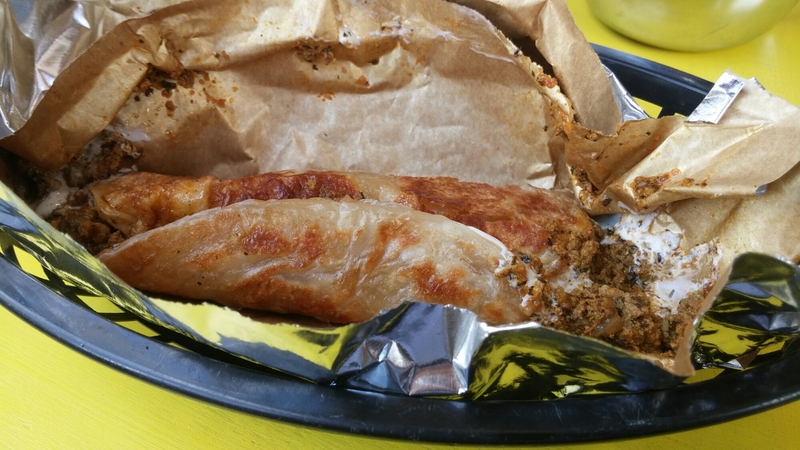 I went for a couple of chappatis – mixing it up with keema and cheese in one and (after consulting the very helpful lady behind the counter – who suggested two was a good size portion) spicy chicken in the other. 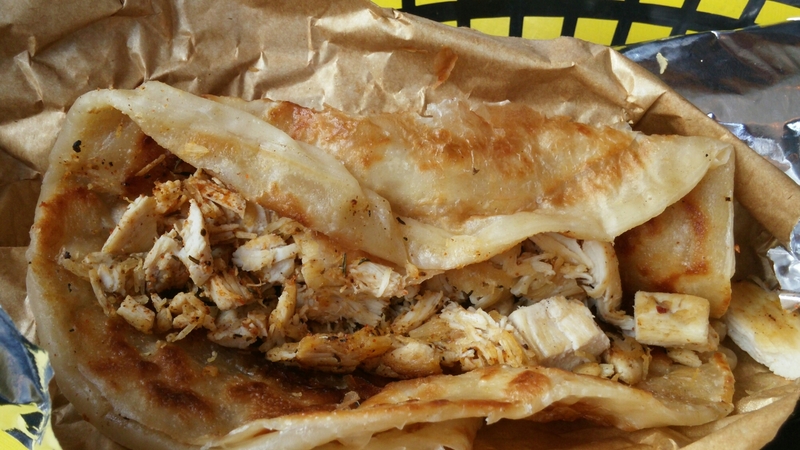 The chicken one (£2.50) was nice with a decent amount of spiced (but not overly so) chicken in a really nice slightly flaky on the outside, yet soft on the inside, chappati. 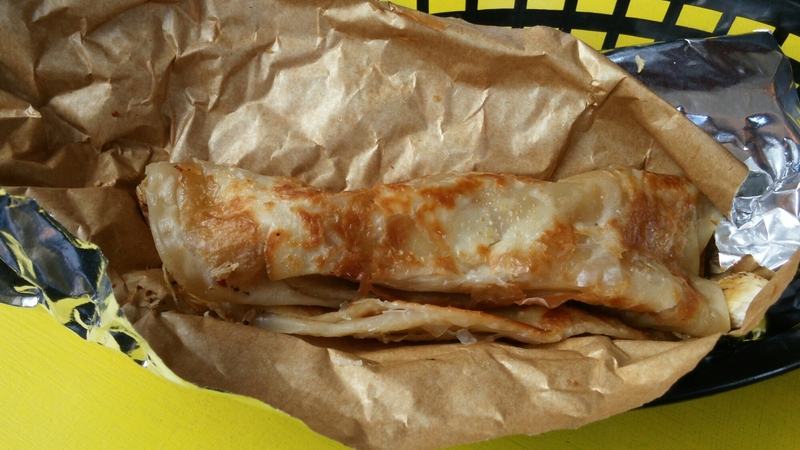 I would, if asked, had said it was a roti rather than a chappati (certainly as I usually know them) but I understand the terms can be interchangable in certain circumstance. Whatever it was (roti, chappati, chapati or something else), it was lovely. My only slight criticism was the chicken filling could have perhaps done with something else. It was in no way dry but something to loosen it up a bit would have added to it. The cheese I had in the other one I order would have done the trick and I would consider adding that if I had the chicken again. The keema with cheese chappati (£3.00) was nicely filled with a more spicey quite runny mix of mince lamb which was really moreish. The food and drink I got was exactly what I imagine you would buy from a street vendor in the Indian sub continent or perhaps the Arabian peninsula. 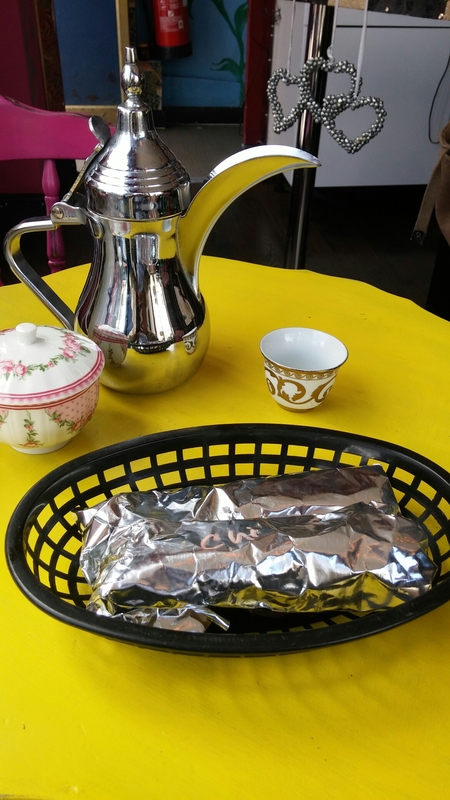 Best way, I think, to eat these chappatis is to unwrap them from their foil wrapping from the top (burrito style). I didn’t do this and made a bit of a mess with the keema one (no napkins on the table) if am honest. Not an unusual state of affairs when I eat. I was expecting a Turkish style black coffee, but what arrived was a cardamon (and clove I think) spiked, quite light, milky affair which, whilst somewhat unexpected, was rather nice. The spices made for an aromatic, but very refreshing, drink that went well with the chappatis. If you don’t like cardamon steer well clear mind. On checking on the internet, I would say it was a Saudi coffee by the look and taste of it. There was a lot in the pot so I thought it was quite good value at £2.50 and a drink that could be shared (am sure if were two people another dinky cup would be forthcoming if asked for). The damage was £8.00 (£5.50 for the two filled chappatis and £2 50 for the large pot of coffee) which I thought was fair for what I got. What I had to eat and drink was very tasty and I was nicely sated after my lunch. It was for me a perfect portion size for a work day lunch. 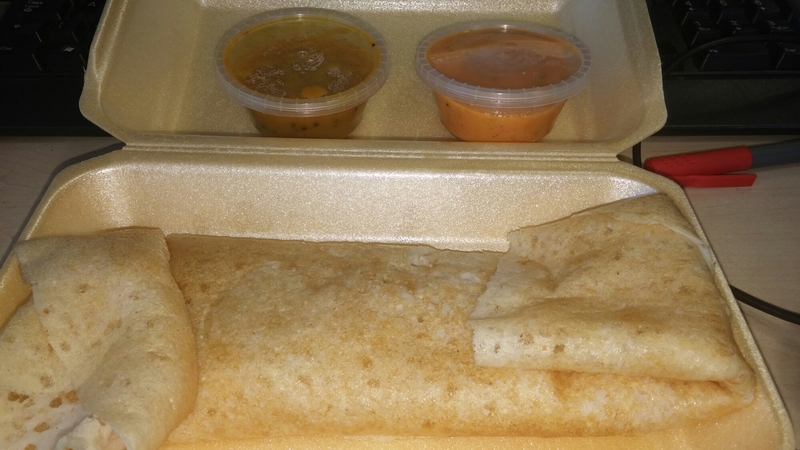 The dosas at £2.50 looked quite substantial and on my visit these seemed to be very popular. I will definately try these on a future visit. On the basis of the prices, it is seemingly easy to get something to eat and drink here for around a fiver or less or you can be a pig like me and spend a bit more. Service was pleasant with explanations as to what was on offer and tasters given of the coffee so you can try before you buy. Getting my food and drink took a while, but it was quite busy. This didn’t bother me, but if you are in a rush it might. Would I go back ? Definitely – an unexpectedly nice and different place for a spot of lunch. They also do takeaways and seem to be doing a brisk trade in these during the lunch time of my visit. Long opening hours also make this a possible refueling stop during or post a night out (if not too late). 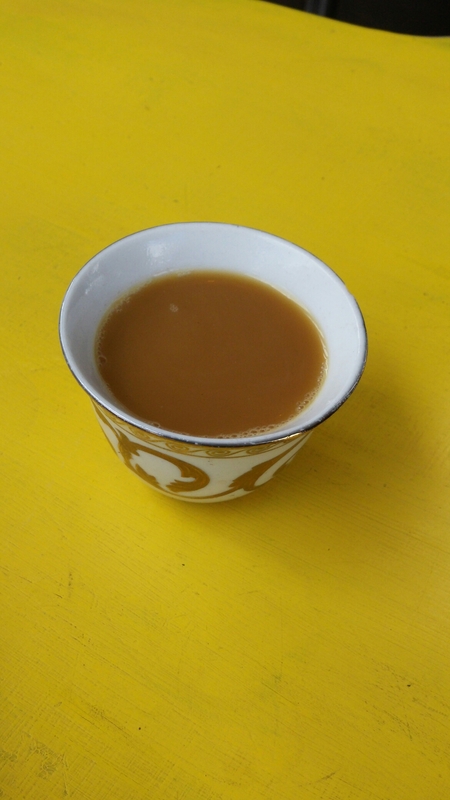 The karak chai is also amazingly good. I do love Gina’s. Such a quirky little place in a sea of corporate. I do fear for it’s longevity though. It’s location must come with a hefty price tag. It is great isnt it – agree rent must be an issue.. Hears hoping they survive and thrive. 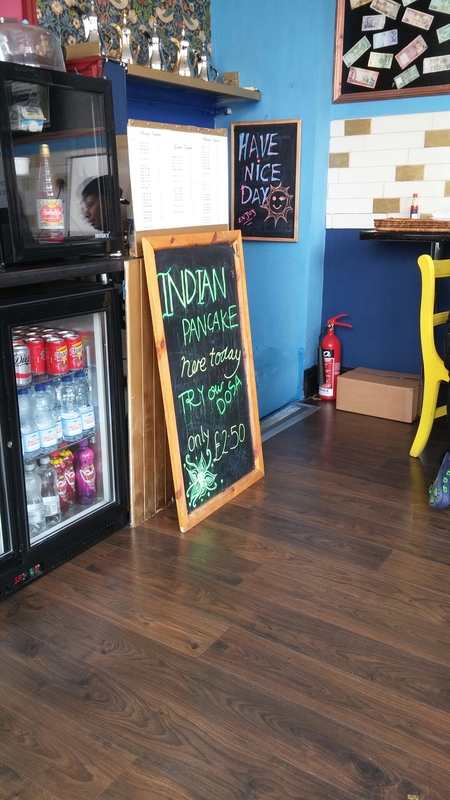 This entry was posted on Jul 26, 2015 by solicitingflavours in Cafe, Cardiff, cheese, coffee, Curry, Drink, Fast food, Food, Indian, lunch, lunchtime, Non alcoholic drink, Restaurant Review, Take away, Tea, Wales.